One of the urban legends of the Mueller investigation was that there were no leaks. Well, some information has come out that totally undoes that myth. Yesterday The Conservative Treehouse posted an article showing that certain information was selectively leaked during the investigation. Please follow the link to the article at The Conservative Treehouse for further details. The press is not fulfilling its calling to provide unbiased news to the American public. Part of that is their fault, and part of that is the fault of Americans who do not take the time to evaluate the news they hear. Yesterday The Gateway Pundit reported that Congressman Collins from Georgia had released the transcript of Peter Strzok’s testimony before Congress. Peter Strzok told then-Majority General Counsel Zachary Somers that the Department of Justice made a deal with the FBI not to search for, or investigate Clinton Foundation emails. This is a clear example of the two-tiered justice system that is infecting this country — Hillary Clinton’s attorneys were allowed to “negotiate” with the feds to make sure they didn’t find her Clinton Foundation emails which would show she was peddling influence and power in a pay-to-play scheme while she was the head of the Department of State. In contrast, the FBI, guns drawn, breaks down the doors of Trump associates in pre-dawn raids and violates attorney client privilege without fear of reprisal. According to reports, the FBI is currently investigating the Clinton Foundation. The Clintons aren’t the only ones who are guilty of corruption — everyone who worked to protect Hillary Clinton and the criminal Clinton Foundation should be investigated and prosecuted. The article includes a screenshot of the exact testimony. I wonder if this information had been available to the public before the November 2018 election if it would have changed anything. Yesterday I posted an article about the release of Bruce Ohr’s testimony by House Judiciary Committee Georgia Representative Doug Collins. There were some obvious differences between Bruce Ohr’s testimony and other testimonies. At some point that will have to be sorted out, but there is another interesting aspect to the story. The Conservative Treehouse posted an article today about the release of the transcript. …Having read the Ohr transcript (also provided below), there didn’t appear to be any national security interests, sources or methods, beyond investigative embarrassment for DOJ and FBI, simply because of the sham of it all. Can we all agree that redactions supposedly in the name of national security have become redactions in the name of keeping the misconduct of the government under President Obama out of the public eye? Yesterday The Gateway Pundit posted an article about the role Nellie Ohr played in spying on the Trump family during the presidential campaign. The connections between Nellie Ohr and the ‘Spygate’ scandal were hidden from congressional investigators for months. As noted previously by TGP, Nellie Ohr is a Communist sympathizer connected to Russia. She is also a corrupt Never-Trumper. It appears that the men in Nellie’s life did all they could to prevent Nellie Ohr from being outed for her involvement in the Russian dossier because she also has links to the CIA and therefore to John Brennan. Now we know that communist sympathizer Nellie Ohr, and the men who surrounded her, her husband, business partners, John Brennan, and by association President Obama, were all connected. Together they attempted to prevent Candidate Trump from being elected and later to remove duly elected President Trump from office. And today we find out Nellie Ohr was also investigating the Trump children during the election while she was feeding Democrat propaganda to the FBI and deep state. The Daily Caller also posted the story yesterday. It seems that Robert Mueller is investigating the wrong collusion. “Imagine if you will…” was the opening line of a television series “The Twilight Zone” which ran from 1959 to 1964. Rod Sterling was the host, narrator, and producer. On January 20th, Victor Davis Hanson posted an article at American Greatness titled, “Should the FBI Run the Country?” The article reminded me of the opening to “The Twilight Zone” in that is imagines the scenario of the FBI running the country. I strongly suggest that you follow the link to read the entire article, but I will provide a few highlights here. During the campaign (2008), unfounded rumors had swirled about the rookie Obama that he might ease sanctions on Iran, distance the United States from Israel, and alienate the moderate Arab regimes, such as the Gulf monarchies and Egypt. Even more gossip circulated that photos existed of a smiling Barack Obama with Louis Farrakhan, the Black Muslim extremist and radical pro-Gaddafi patron, who in the past had praised Adolf Hitler and reminded the Jews again about the finality of being sent to the ovens. (A photo of a smiling Obama and Farrakhan did emerge, but mysteriously only after President Obama left office). Imagine that all these tales in 2008 might have supposedly “worried” Bush lame-duck and pro-McCain U.S. intelligence officials, who informally met to discuss possible ways of gleaning more information about this still mostly unknown but scary Obama candidacy. But most importantly, imagine that McCain’s opposition researchers had apprised the FBI of accusations (unproven, of course) that Obama had improperly set up a private back-channel envoy to Iran in 2008. Supposedly, Obama was trying secretly to reassure the theocracy (then the object of Bush Administration and allied efforts to ratchet up pressures to prevent its acquisition of nuclear weapons) of better treatment to come. The conspiratorial accusation would imply that if Iran held off Bush Administration pressures, Tehran might soon find a more conducive atmosphere from an incoming Obama Administration. Additional rumors of similar Logan Act “violations” would also swirl about Obama campaign efforts to convince the Iraqis not to seal a forces agreement with the departing Bush Administration. Further, conceive that at least one top Bush Justice Department deputy had a spouse working on the McCain opposition dossier on Obama, and that the same official had helped to circulate its scandalous anti-Obama contents around government circles. In this scenario, also picture that the anti-Obama FBI soon might have claimed that the Obama Iran mission story might have been not only an apparent violation of the Logan Act but also part of possible larger “conspiratorial” efforts to undermine current Bush Administration policies. And given Obama’s campaign rhetoric of downplaying the threats posed by Iran to the United States, and the likelihood he would reverse long-standing U.S. opposition to the theocracy, the FBI decided on its own in July 2008 that Obama himself posed a grave threat to national security. More importantly, the FBI, by its director’s own later admission, would have conjectured that McCain was the likelier stronger candidate and thus would win the election, given his far greater experience than that of the novice Obama. And therefore, the FBI director further assumed he could conduct investigations against a presidential candidate on the theory that a defeated Obama would have no knowledge of its wayward investigatory surveillance, and that a soon-to-be President McCain would have no desire to air such skullduggery. Obama, in our thought experiment, would have charged that the role of the Bush-era FBI, CIA, DOJ, and special counsel’s team had become part of a “resistance” to delegitimize his presidency. Indeed, Obama charged that conservative interests had long wanted to abort his presidency by fueling past efforts to subvert the Electoral College in 2008, to invoke the Logan Act, the 25th Amendment, and the Emoluments Clause (based on rumors of negotiating lucrative post-presidential book and media contracts by leveraging his presidential tenure), as well as introducing articles of impeachment. Celebrity talk of injuring Obama and his family would be daily events. Actor Robert De Niro talked of smashing Obama’s face, while Peter Fonda dreamed of caging his children. Johnny Depp alluded to assassination. It soon became a sick celebrity game to discover whether the president should be blown up, whipped, shot, burned, punched, or hanged. Imagine that if all that had happened. Would the FBI, CIA, or FISA courts still exist in their current form? Would the media have any credibility? Would celebrities still be celebrities? Would there ever again be a special counsel? Would we still have a country? Hopefully by now many Americans have awakened to the government abuses involved in surveillance of the Trump campaign, appointment of the Special Counsel, arrests of people associated with President Trump for things not related to any of what the Special Counsel is supposed to be investigating, and inappropriate use of force to arrest a 60-something-year-old man with a deaf wife. No wonder the FBI and DOJ are fighting so hard to prevent the truth of their abuses of power during the Obama administration from being revealed. Now it’s time to talk about the other shoe some Americans are waiting to drop. Let’s talk about the evidence for the government’s abuse of power in dealing with candidate Trump and later President Trump. 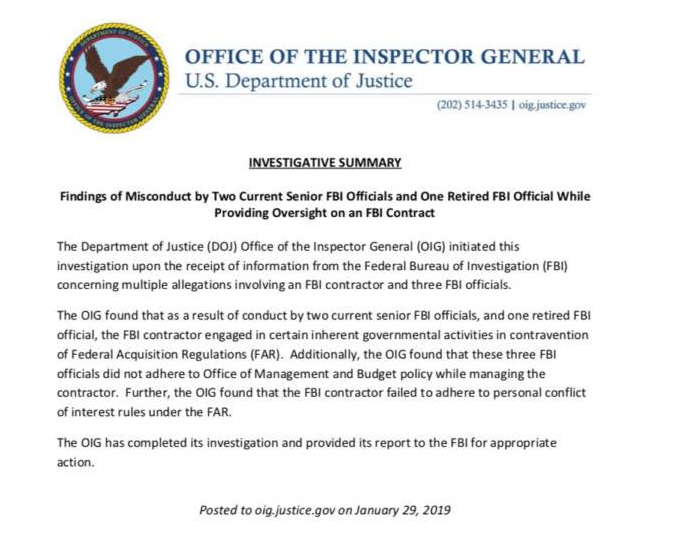 The article includes documentation on the four investigations and notes that because of “the sensitivity of the matter,” the FBI did not notify congressional leadership about this investigation during the FBI’s regular counterintelligence briefings. So the FBI was purposely avoiding congressional oversight. John Brennan realized someone has focused attention on Comey’s admission to congress that the FBI intentionally kept congress in the dark during the construct of the counter-intel narrative. Congress was kept in the dark during this phase because the narrative can only thrive with innuendo, rumor, gossip etc. The appearance of the investigation itself was the political need; the substance was non-existent and immaterial to the creation of the narrative. If Comey notified congress, via the Gang of Eight oversight, the counter-intel narrative would have been harder to manufacture as details would have to be consistent. That’s the benefit to keeping any oversight away while creating the politically useful narrative. John Brennan, facing the looming certainty of the underlying Russian ‘collusion evidence’ being non-existent, in 2017 was trying to give the appearance that he briefed congress on larger Russian election interference issues. However , the trouble for Brennan is his own admission that these issues were the underlying principle for the FBI counter-intelligence investigation. Brennan specifically says he gave his intelligence product to the FBI. The material within Obama’s PDB, placed by Brennan, is what initially set off alarm bells for Devin Nunes (early 2017) because the material underlying the PDB intelligence product was unmasked by Obama’s National Security Adviser Susan Rice. The actual investigation by the Justice Department and FBI began during the election campaign. Using half-baked and “unverifiable” intelligence about Trump’s purported links to Russia, officials used the so-called Steele Dossier four separate times for FISA court approval to spy on the Trump campaign. The only problem is, the Steele Dossier didn’t come from the FBI or Justice Department. It came from Fusion GPS, an opposition research group linked to the Democrats. And Hillary Clinton’s campaign paid for it. So for all intents and purposes, the Deep State holdovers from the Obama administration were serving as an adjunct to Hillary Clinton’s campaign. Early on in the investigation, CIA chief John Brennan convened multi-agency meetings about Trump. They included Peter Strzok, the head of the FBI’s counter-intelligence, and James Clapper, national intelligence director under Obama, among others. This is the shoe that has evidence attached. I can promise you that if the rogue members of the DOJ and FBI are not held accountable for their behavior, we will see more of this in the future. At that point, no candidate that does not reflect the values of the deep state will ever be elected. Yesterday The Conservative Treehouse posted an article about the uniparty that current controls Washington, D.C. The uniparty is made up of the professional republicans and the professional democrats. Their common enemy is Donald Trump. The same UniParty dynamic is visible in the way the FBI/DOJ and aggregate intelligence community were weaponized against Donald Trump – with Democrats and Republicans participating in the unlawful processes. Now, in the downstream consequence phase, we see a UniParty defense approach to block Trump from revealing what happened. I’m not sure people fully completely understand this dynamic within “spygate”. It was not a targeting operation by democrats; republicans were just as complicit. The ongoing goal to eliminate candidate and president Trump is *not* partisan. Which brings me to the current state of the advisers around the executive. Remember, there are trillions at stake here – and the downstream benefactors are both Republicans and Democrats who make up the UniParty. Within the UniParty dynamic, in order to retain full financial benefit, the political class need to align with Wall Street priorities. That alignment means the UniParty needs to eliminate Main Street priorities that are adverse to their interests. Border controls and immigration enforcement are adverse interests to the UniParty. Additional cross party alignment to benefit Wall Street surrounds: •budgets and massive government spending; •government controlled healthcare retention; •government controlled education (common core); •and most importantly the removal of any national economic and trade policy that would threaten the structure of the multinationals. On all of these issues the Democrats and Republicans have identical outlooks, common interests and mirrored legislative priorities. It is not coincidental that US Chamber of Commerce President Tom Dohonue also outlined these issues as primary priorities for his massive lobbyist spending. There are trillions of dollars at stake; and we must never discount how far the Big Club participants will go to ensure the White House counselors are shaping their advice toward those objectives. This is a pretty good explanation as to why the promises that Republican Congressmen running for office made were broken–as long as President Obama was in power, they were safe promises–he was not likely to sign any law they passed that differed from Democrat ideas. When President Trump was elected, the Republicans had to put up or shut up. They chose to shut up in order to maintain their big donors and people they are beholden to other than the American voters. With a few exceptions, we haven’t had Republican leaders in Congress since Newt Gingrich, and the establishment did a pretty good job of marginalizing him. If the Republican party continues on its current path, it will no longer exist in five years. I suspect we have not heard the last of this. It appears to be government overreach, but I guess we will have to wait and see.